Want to be a photographing cowboy? Join the Wild, Wild West of DSLR-toting photographers with the BlackRapid RS DR-1 Double Strap, which lets you sling two cameras around your hips as you stroll through the town’s mean streets. 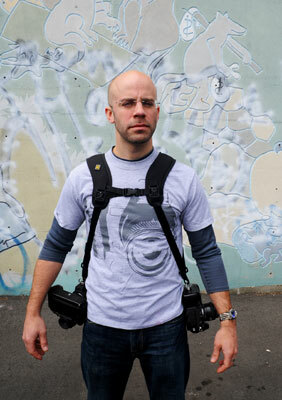 The harness attaches to your shoulders, making you look like a space age video game hero. Connected to it are two camera straps that extend down your body. To complete the effect, you’ll need to hook a camera each to both straps using the included FastenR-2 module. Why, in heaven’s name, would you carry two cameras around? If you have to ask the question, you probably don’t need to. For professional shutterbugs who need two DSLRs with different lenses, though, the RS DR-1 is likely a godsend (apart from making them look badass). Instead of hauling two straps that can entangle and leave their cameras bumping against each other, they can comfortably work through the day without worry. For fashion’s sake, you can probably pull off sporting this double-strapper to carry only one camera too – just hang your headphones or a bandanna on the other strap. If you’re feeling especially cowboy-like, you can try hosting a real gun in there. Make sure to don a Lone Ranger hat while you’re at it. The BlackRapid RS DR-1 Double Strap will be available internationally beginning mid-June for $130.